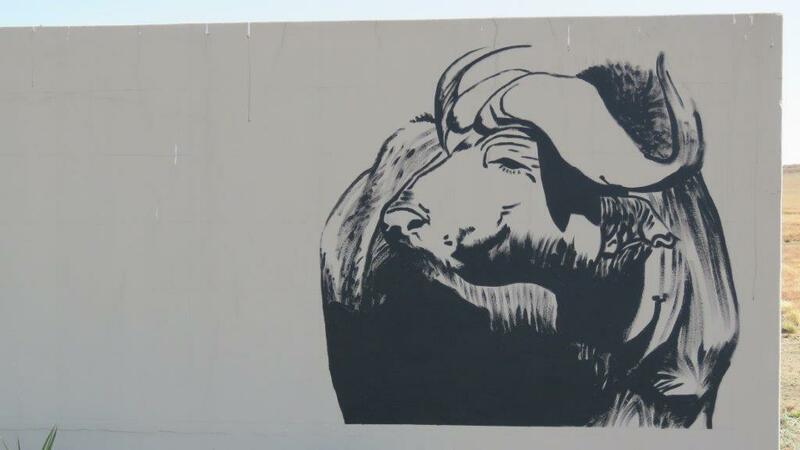 It is not common to find hippos in the Freestate, especially not in the region of Memel, a small town in the north-eastern Freestate at an altitude of 1700 meters where winter temperatures of -19 degrees Celsius have been recorded! But the name Seekoeivlei, which is Afrikaans for “Hippo wetland”, is not misleading: we saw several Hippos basking in the winter sun outside some of the deeper channels of the wetlands inside the Seekoeivlei Nature Reserve. 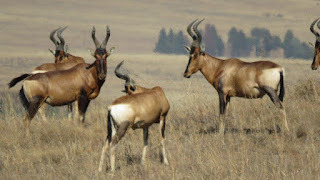 But the main attraction here is not the Hippos, Black Wildebeest, Red Hartebeest, Roan, Zebras, or the Buffalo that you will find, rather the many bird species (more than 230 recorded) that attract nature lovers and bird watchers from far away. This is also part of one of Birdlife SA Important Bird Areas (IBA SA125). Scarce and endangered species such as the Wattled, Crowned and Blue Cranes as well as Whiskered Terns can be seen and breed here. Four other Red Data bird species are partially or wholly dependant on the wetland namely the Little Bittern, Yellowbilled Stork, Grass Owl and the extremely rare White-winged Flufftail. Due to the presence of dangerous animals, the only activities allowed inside Seekoeivlei Nature Reserve are self-drive game viewing and bird watching. Organised horse rides and mountain bike events are presented from time to time. No water sport or fishing is allowed. Not many reptiles are present on the reserve, possibly due to the cold temperatures. In his 6 years as manager of Seekoeivlei Nature Reserve, Morne Pretorius has not encountered any snakes. Being part of the Highveld grassland biome, it is not surprising that 27 different grass species and even a bigger variety of plant species, including wild rice, occur in the reserve. The roads inside the reserve are jeep tracks with cement surfaces in many places. Vehicles with good ground clearance should not experience problems during dry periods. During the rainy season in summer months, many of the roads will be flooded and inaccessible. The reserve is not big and the 30 kilometers of jeep track roads through the reserve of 4,500 hectares will take less than 4 hours to cover in detail with ample time to watch the game and birds along the way. There are 3 fixed bird hides well situated in the reserve from where you can get close to the waterbirds. 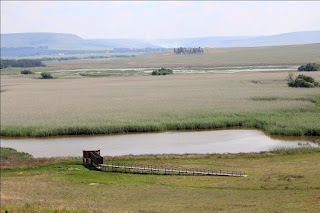 A mobile bird hide is positioned according to the current water levels by the reserve management. 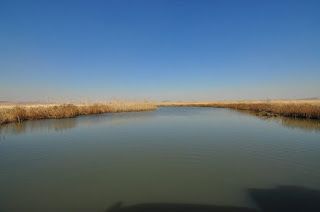 The Klip River, which is a major and reliable tributary of the Vaal River and eventually the Vaal Dam which provides Gauteng with water, originate at Normandiens Pass, about 40km south, and runs through this floodplain with a total area of 12,000 hectares. During dry winter months, snow in the catchment area contributes to the continual flow of the Klip River. The wetland covers 3,000 hectares inside the reserve of 4,500 hectares which was proclaimed in 1993 and received its Ramsar status of International Importance on 21 January 1997. There is a nice viewpoint on the south-western side of the reserve from where parts of the 220 oxbow lakes can be seen. This marshland is a very important sponge area for the Vaal River catchment area. Peat marshes, with low conservation status in other areas, occur here. Seekoeivlei Nature Reserve is situated between the municipal grounds of Memel and 12 neighboring commercial farmers. The co-operation between the different entities is good, but as with most wetlands, there are challenges. Water pollution from the nearby rural settlement of Zamani into Pampoenspruit which feeds into the Klip River, challenges the filtering system of this wetland to the utmost. Regular hunting/poaching with dogs for mammals and birds in the reserve is a reality. There are also mining applications clouding the future of this irreplaceable natural resource. I hope and trust that sanity will prevail and the authorities will never approve these applications that are nothing but short-sighted and full of greed. “Memel” is a Prussian word meaning “surrounded by water”. This reflects in the many fountains and shallow surface water surrounding the town. With an average rainfall of between 800 and 1200mm per year (mainly summer), it is no surprise this is the largest wetland on the Highveld. Brand-new accommodation options inside the reserve were not operational yet during our visit. 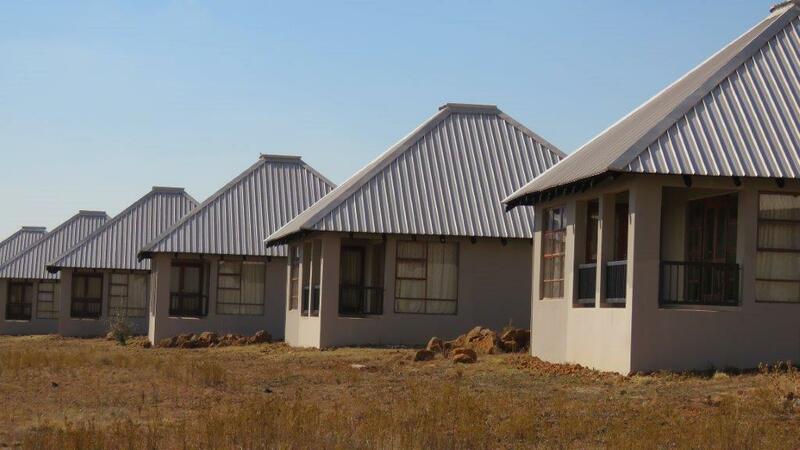 This comprises of 8 x 4-bed chalets overlooking the largest part of the wetland, as well as a campsite with 6 stands. It is expected that these facilities will be open to the public before the end of 2015. I believe this will be a big plus to people who want to visit Seekoeivlei Nature Reserve and a boost for tourism in the area. 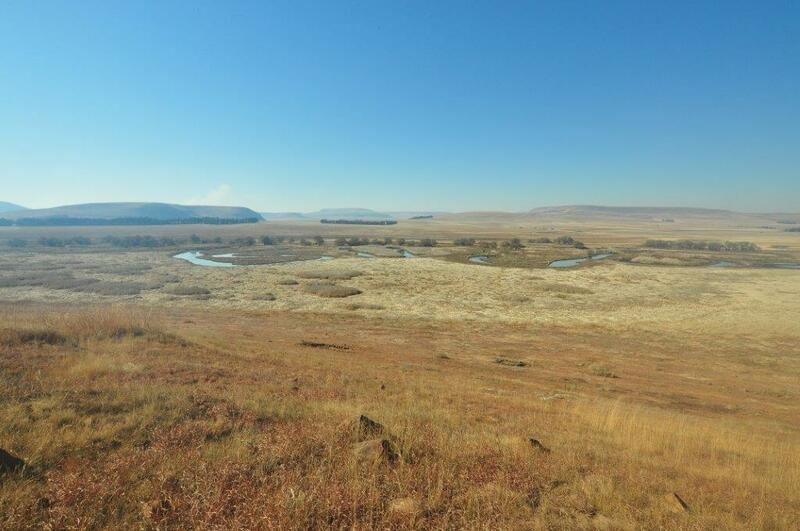 Other attractions in the Memel area include 4x4 routes, 6 mountain passes nearby (Bothas, Collins, Mullers, Normandien, De Beer and Van Reenen’s Pass), horse riding, bass fishing, hiking, camping. 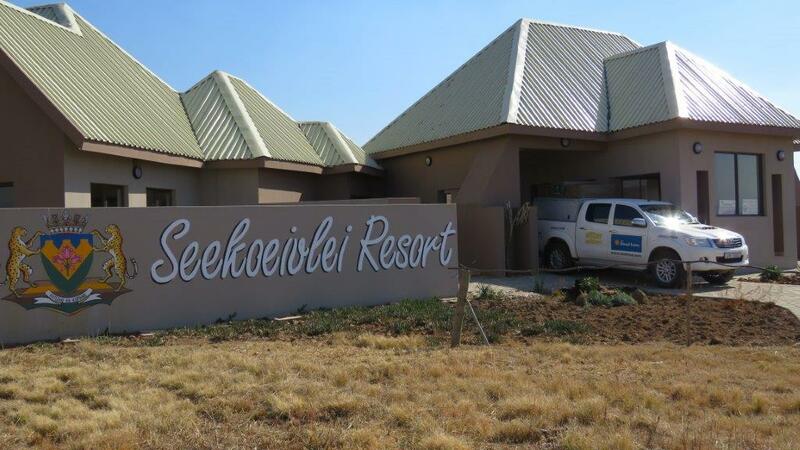 This offers good synergy between the attractions of Seekoeivlei Nature Reserve and these other tourist attractions in the area. Memel is only 280km from Johannesburg, roughly between Volksrust and Newcastle, and offers a popular destination for nature lovers and adventure seekers. 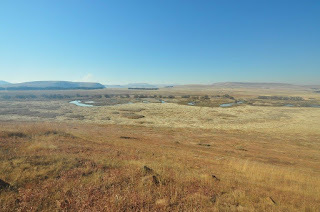 Interesting historical facts of Memel include the fable of the 12-year old Racheltjie de Beer who died while trying to protect her 6-year old brother from the winter cold by giving him all her clothes and shielding him from the cold with her naked body in front of a hollowed-out anthill. It is believed this happened on the farm where the nature reserve is today. The 1914 rebellion originated here in the Memel district under the leadership of Genl CR de Wet.